From 72€ per night - 19 rooms of 6 types. 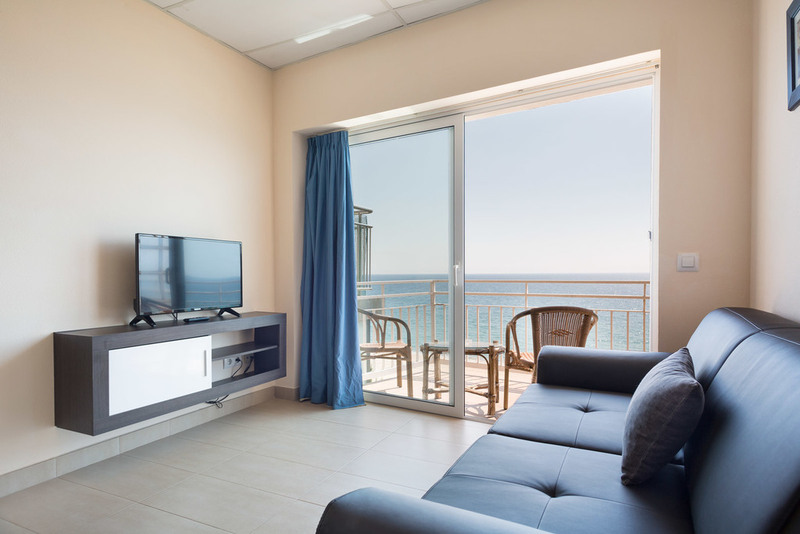 If you come with family, stay in the sea view apartment with capacity for 4 people. The apartment consists of a room with a double bed of 150cm and a diaphanous space where the living-dining room and the rest area, with a double bed of 135cm, share the same environment. This apartment has a fan, it does not have air conditioning. This apartment can accommodate a child up to 2 years old free of charge (cot subject to availability). The most comfortable option for families. 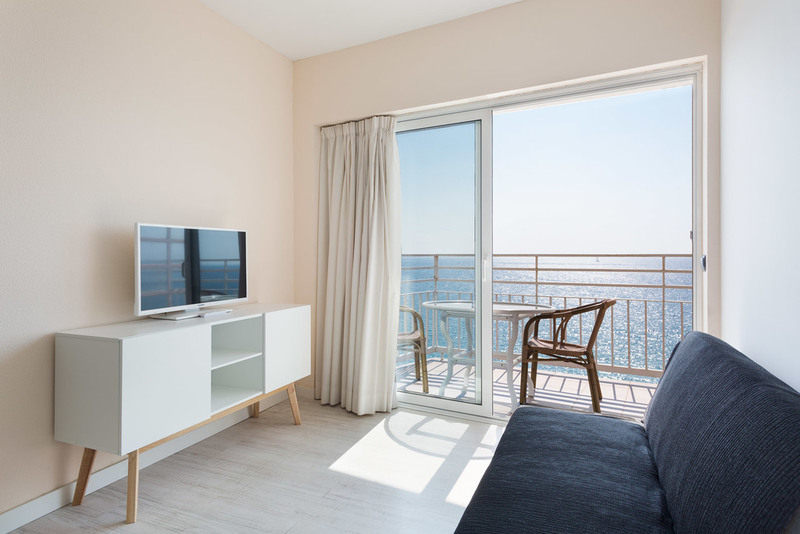 Create fantastic memories by staying in the sea view apartment, with capacity for 4 adults, 2 children up to 12 years old and 1 child up to 2 years old (cot subject to availability). The apartment consists of two rooms with two single beds of 90cm each and a diaphanous space with two single beds for the little ones. The open space joins the living room. The apartment has 2 equipped bathrooms. This apartment has a fan, it does not have air conditioning. It has a room with a double bed of 150cm and a dining area with a sofa bed. 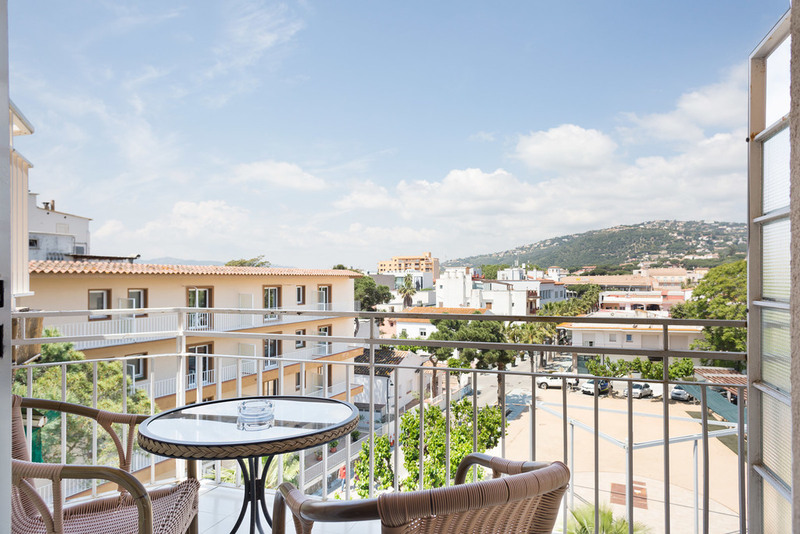 Ideal for couples, this quiet apartment of 40m2 can accommodate 2 adults, 1 child up to 12 years old and 1 child up to 2 years old sharing a bed or in a cot under availability. This apartment has a fan, it does not have air conditioning. 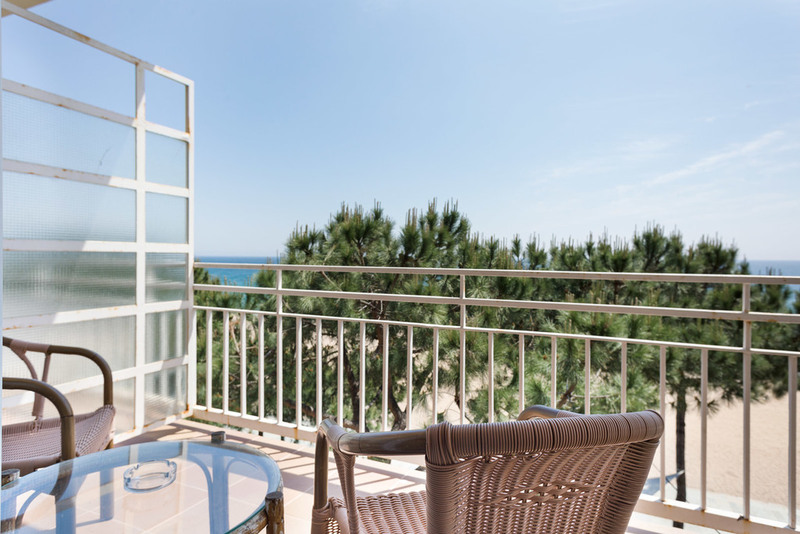 Staying in the sea view apartment with air conditioning, heat or cold will not be a drawback in your holiday. The apartment consists of a bedroom with a double bed of 150cm and a diaphanous space with a double bed of 135cm that joins the living room. This apartment can accommodate a child up to 2 years old free of charge (cot subject to availability). 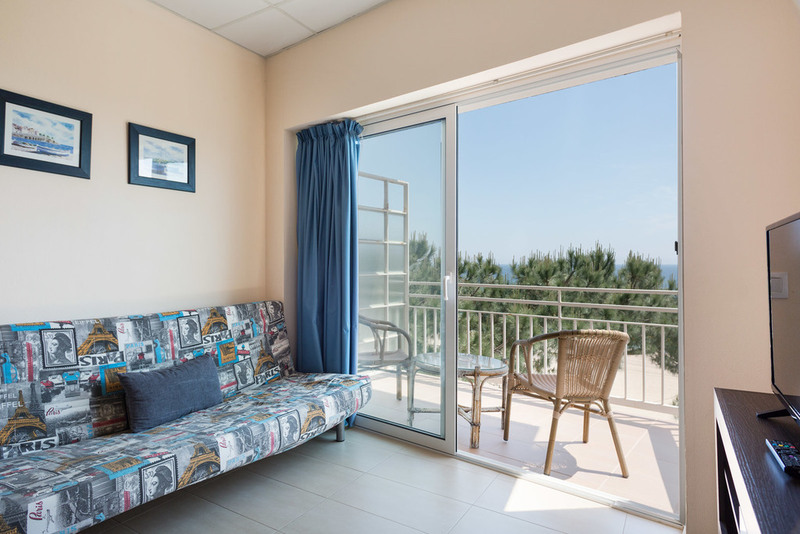 This penthouse apartment can accommodate 4 adults, 2 children up to 12 years old and a child up to 2 years old (cot available upon availability). It has 2 rooms with a double bed of 150cm each and a room with 2 single beds or a bunk bed for the the little ones. In addition, the apartment has 3 equipped bathrooms. The apartment has a washing machine and dishwasher, in order to make your holiday more comfortable. 35m2 studio loft with air conditioning. The rest area and the dining room come together in one. It has a 135cm double bed and a sofa bed. Without a doubt, your perfect refuge after a day at the beach. The best? Its magnificent views of the sea. This apartment can accommodate 2 adults, 1 child up to 12 years old or a child up to 2 years old sharing a bed or in a cot upon request.